Life in the Spirit is about who we are becoming in Jesus. It’s easy for us to become discouraged about who we are in the moment, but God always speaks from our future into our present. What do you do when you’re being judged? It’s a good time to remember that it’s never about other people, it’s about the Lord and what He’s saying to you. What’s His perspective? What is possible in a life of constant peace? If you had peace right now, what would you be seeing? What would you be saying? How would you be feeling? The truth is, Jesus is never negative; He is always positive and He is always in us. Knowing this truth means we never have to react negatively to a situation because peace is so compelling. If we are in Christ, then so are all of our circumstances. He is in us, we are a habitation in Him and we can’t be separated. So if we can’t be separated from the love of God, then neither can our circumstances be separated from the presence and power of God. Heaven has a right of possession over us in Christ, giving it the right to acquire our problems and provoke God’s favor to overcome them. We have favor with God through our placement in Christ, granting us an intentional bias in His heart and empowering us to ask Him for the things that are in line with His loving-kindness towards us. Rejoicing is where we match God’s purpose and intention with our own and say “‘yes and amen” to who He wants to be for us. It’s agreement and engagement with who He really is. Through rejoicing, we can see how God wants to turn everything around and make it work for our good because it empowers us to receive when we are under pressure. It keeps us away from giving into fear, doubt, and unbelief by causing us to remain fresh in faith and the Lord’s presence. The key to all spirituality is majesty because it gives us a sense of who God is in everything that we do and experience. Majesty governs how we think about the Lord, our expectations of Him, and our experience of His favor in our life. By entering into majesty, we have the opportunity to become the happiest individual on the face of the earth. Anything less than majesty in our relationship with God is an inferior way to live. The key to effective learning is your ability to unlearn something you thought you knew. When we come into the Kingdom from the world, God divests us from everything the world taught us. He is now only dealing with the new, true us in Jesus, and we don’t need anything from the old to teach us about who we are in Christ. We can live a life of celebration, knowing that God is powerful, faithful and wonderful on our behalf by giving thanks for who He is and who we are becoming in Him. I continually give thanks to God for being the kindest person I have ever met in my entire life. When we walk with God, peace is one of the most tangible signs of His presence. He promises that we will always have a deposit of peace in our life because He is the God of peace, the very Prince of Peace. God doesn’t want us to know truth in our head; He wants us to know the truth in our heart and have it revealed in the way we see, think, speak and act. The Fruit of the Spirit is an encounter with God that leads us into an ongoing experience of who He is, creating a place for us to learn how we can abide in His nature. They give us the power of God and enable us to become Christ-like, which is always His primary intention. The old you is irrelevant, useless and out-of-date, and has no power to make itself new. However, our old mindsets, practices, language and lifestyle can contain the Holy Spirit and prevent us from discovering who we really are in Jesus. The mind of Christ allows us to turn a weakness into a joyful vulnerability to His goodness. In Him, we get to take all negative thoughts captive and turn them into brilliant ones. Our mindset is either working for us or against us, and through our new mind in Jesus, we always have upgrades in thinking available to us. Spiritual warriors walk humbly with God because they know humility is not timidity. They live from the reality of having confidence access to God through the sacrifice of Jesus on the cross. We have the opportunity to become a spiritual warrior that fights from the total majesty and the absolute certainty of God’s unchanging nature. When we feel intimidated by life’s situations, we have an opportunity to upgrade our intimacy with His nature and come into an experience of what He is really like. Abiding is about dwelling, living and remaining in the space God has created between Jesus and Himself. This gives us a place to have an intimate connection with both the Father and the Son, and the privilege of remaining there as the beloved. Every circumstance gives us the opportunity to think brilliantly about God, ourselves, and the situation we are in. The key is learning to think with Jesus and live from His mind in order to receive the upgrades available to us in these situations. Our role in the earth is to be loved by God and then respond to that love. God gives us His love so we can be restored to His passion for us, which is defined by the way He loves and speaks about Jesus. Rest is the tangible expression of God’s presence. When we practice it, we’ll feel His touch, hear His voice, and experience His presence in a renewed way. Rest allows us to guard our inner territory and displace any negatives trying to infiltrate our lives because it’s a brilliant weapon against the enemy. Victory is our starting place in the Kingdom. We don’t need to get anywhere in our situations because we are already there in Jesus, giving us a breakthrough and victory that has already been assigned to us. We can’t live in Jesus and not be highly favored. Rest is the key to overcoming our trust issues so that we can receive our provisions, blessings, and ultimately the fullness of our inheritance. God wants to have several relationships with us so we can experience Him in completely different ways. Each one of these relationships is key for different stages of our development in Him. When God hears the world, He hears something different than we do. He listens to the longings, hunger, and cries in people’s hearts. Yet, do we hear the desperation and the cries of wounded people? And furthermore how are we going to display God’s original intention towards them? God knows when we do something for the first time, we are going to make a mistake, but He doesn’t call it a mistake. He sees it as learning because we haven’t done it before. As we walk with God through life, we are learning to handle both the extreme situations and the joyful tensions. Setbacks and tough days are opportunities to develop a greater resilience. God has designed a spirituality so profound that on our worst day it’s magnificent. God gives us the upper hand in places we have known defeat and elevates us to a higher place of victory than we have ever known. Where the world has taught us that we have to pay our dues and work our way up to the top in order to become successful, the Kingdom says that all our dues have been paid in full by Jesus. The lens of the Kingdom gives us the unique perspective of Jesus which will renew our thinking and elevate our identity in the new man. There is only one life! Christ in you provides the same power and privilege that He enjoyed as a Son. When you live fully in Him, you walk in expectation that will always be greater than your circumstances. This means there is only one life for us to be living: the life that He lives. The lens of the Kingdom gives us the unique perspective of Jesus, which will renew our thinking and elevate our identity in the new man. His perspective offers an entirely different way of seeing, thinking, speaking, and acting. It is the way, the truth and the life of how we live in the Kingdom with the Father. This is reading from one of my latest devotional books, the Nature of Freedom, part of the Letters fro God series. His viewpoint will empower you to grow quickly and to journey in life in the elevated perspective of the Kingdom. Walking with big Jesus is about letting go of any poverty thinking, and learning to develop a majesty mindset in terms of who we are becoming in the Lord. Grace is not undeserved favor. Grace is the empowering presence of God, that enables you to become the man or the woman that God sees when He looks at you. Worship is not really for the Lord; it is for us because it makes us vulnerable to His goodness. 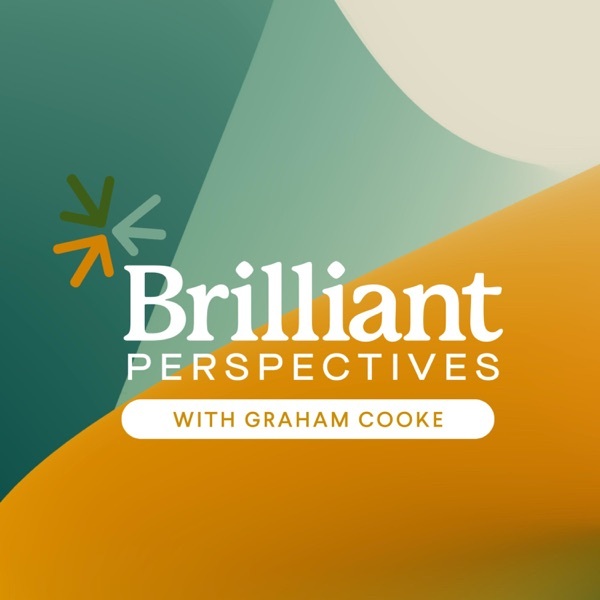 I’m thrilled to announce the official launch of the Brilliant Perspectives Podcast. After all your great feedback from, we are officially published on iTunes.